Dashboard-First Steps: To inform Admins if the basic Delegate365 configuration is missing, the dashboard now shows a First Steps box if necessary. 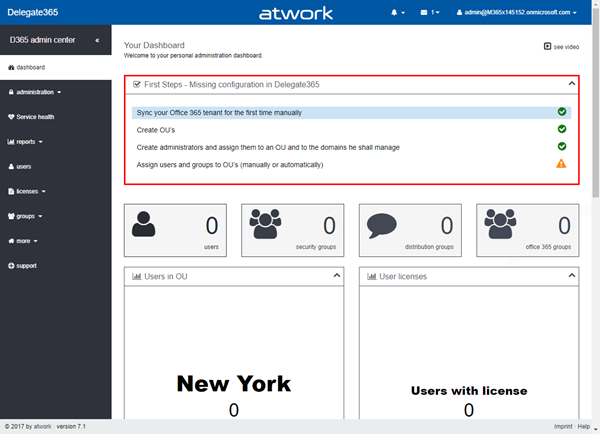 This essentially helps new Delegate365 admins to show the required steps to configure Delegate365. Tasks that are already accomplished are marked with a green OK icon, open tasks are shown with an orange warning icon. 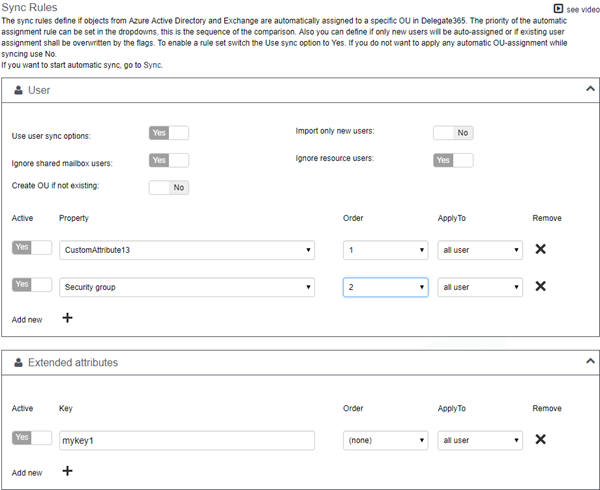 So, this feature basically checks if they SyncOp has been executed to update the Delegate365 cache at least once, if at least one OU is existing, if at least one administrator has been assigned to one OU and one domain and if there are users assigned to any OU (so that there are users visible in Delegate365). The admin can click on the task to open the corresponding page to configure the desired properties. The following screenshot shows an example with three accomplished tasks and one open task. Once all requirements are satisfied, the First Steps box will no longer be visible (or show up again, if any requirement is missing). There is no manual method for switching the First Steps box on or off, it appears automatically to support the admin. 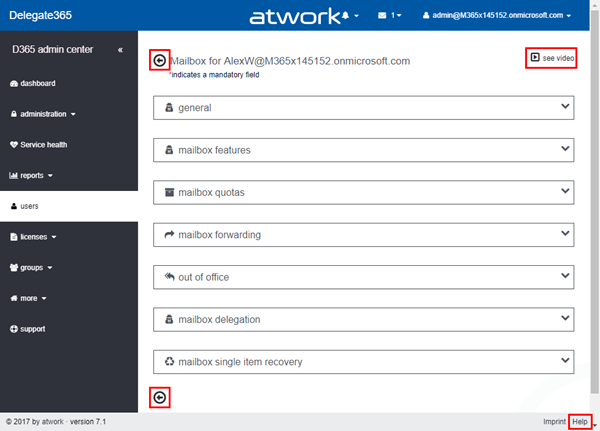 Independently, Delegate365 checks if the connections to Azure Active Directory and Office 365 are valid as well. We think, this new feature makes sense in existing Delegate365 tenants and particularly in new ones. Quicker Dashboard: The dashboard now uses dynamic loading of the content to get a better user experience. So, the start page loads faster and shows the content when available. Small animated circles are shown until the boxes are able to show their content. This makes sense since the Office 365 service status sometimes took longer time to load and the whole page produced unnecessary waiting times. This behavior is gone now and admins get the dashboard page much faster. New UI elements: Detail pages now show a back button icon on the top and bottom of a page (instead of the text link "Return to the list…") to improve the visibility for the user for going back to the previous page. Help and Videos: Additionally, each page got a see video link on the top (see screenshot above). This opens a short video explaining the current page (well, we are still working on the videos, so if the overview video is shown, pls. give us some time to finish that for all modules). The video integrates into the page and allows to interactively control the video. By closing or clicking outside of the dialogue, the video box closes. We think this will help administrator to watch the functionality of the current module and to inform about the topic. 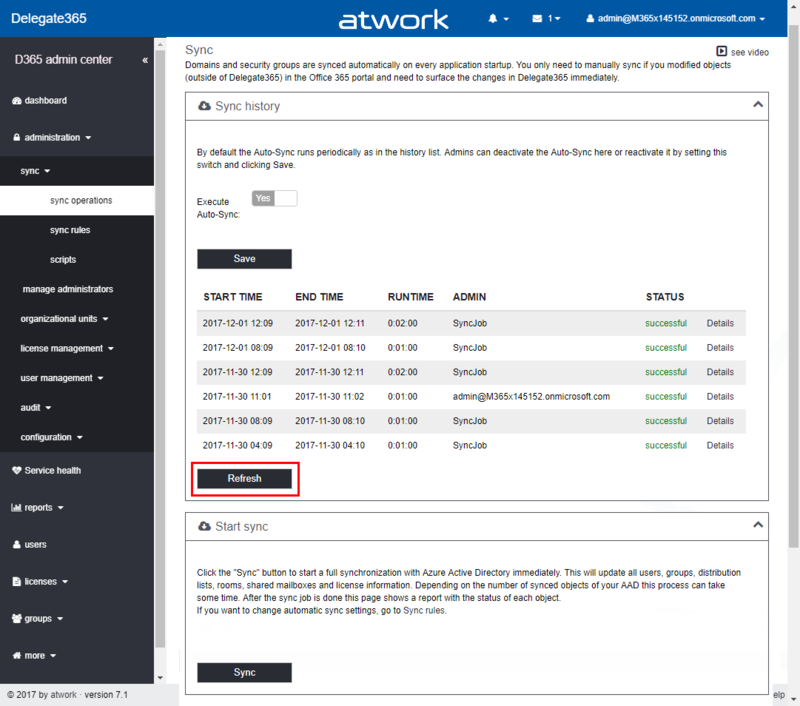 Help page: The Help link available on the right side in the footer now uses the same concept and shows the initial steps for configuring Delegate365 in short videos. Again, these videos will be updated in near future. Sync-Rules UI standardization: The Sync Rules allow to define conditions for automatic OU assignments and Office 365 license assignments for users and groups in Office 365. We added more features in here, but the basic user’s OU assignment interface did no longer fit to the rest of the conditions. In previous versions, the dropdowns needed to be filled with the priority of the desired rule, where the property name must match any OU name in Delegate365 (as f.e. CustomAttribute13 stores "New York" and there is an OU "New York", so that the user gets assigned automatically). In contrast, newer conditions (in the boxes below) used dynamical assignments. So, the User box has been changed to the new dynamic conditions interface as well. 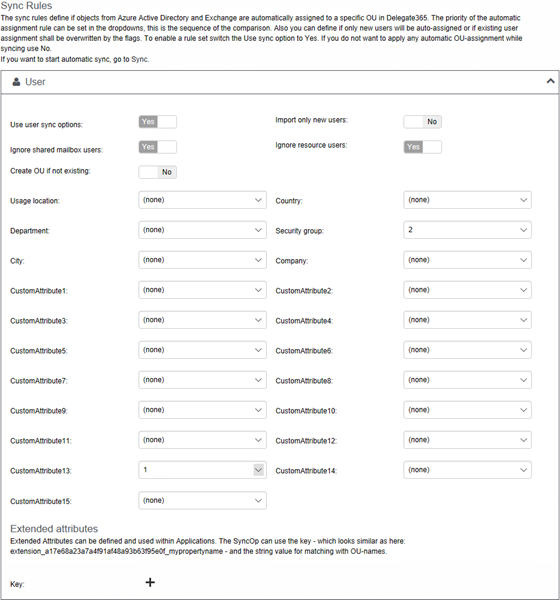 For better clarity, now the admin can add more conditions dynamically as needed. Additionally, each rule can be set (in)active and the SyncOp can apply the rule to all users, sign-in allowed users or sign-in blocked users in the new user interface. Also, the Extended attributes have got an own box with the same options and allow a more customized filtering. Existing customers: All existing rules are automatically converted to the new interface. There is no action needed, but we recommend to check these settings and to save this page again. SyncOp performance: Since the Delegate365 synchronization fulfills a bunch of tasks, we are constantly checking and improving the SyncOp. Version 7.1 brings more error handling and better performance for specific operations as the User License Sync. So, in real world, the sync time can speed up, depending on the scenario. New SyncOp Locking "There can be only one": In former versions it was possible to start a manual sync multiple times, even when a scheduled sync was already running. This sometimes lead to confusion when objects should be modified that already were updated. To avoid such conflicts, the sync now runs only once at a time. If an admin wants to manually start a new sync while another sync is running, he gets a message informing about that. A new SyncOp cannot be started therefore. To check a currently running SyncOp, there’s a new Refresh button in the sync history box (see above) to see the status if needed. In such a case, pls. wait until the previous SyncOp is finished and then try to restart. The sync now checks the heartbeats if another SyncOp is running or died during any process (we are working with the cloud…). A new SyncOp can be started manually after a previous sync is finished, or after 15 minutes if a timeout occurred. Usually, if a SyncOp did not fully complete for any reason, simply wait (or start a SyncOp manually) for the next run to accomplish all tasks. Automation for user’s MFA status: Version 7.1 brings a new feature in the administration / sync / sync rules: A new box for setting Multi-factor authentication for users controlled by a group membership. 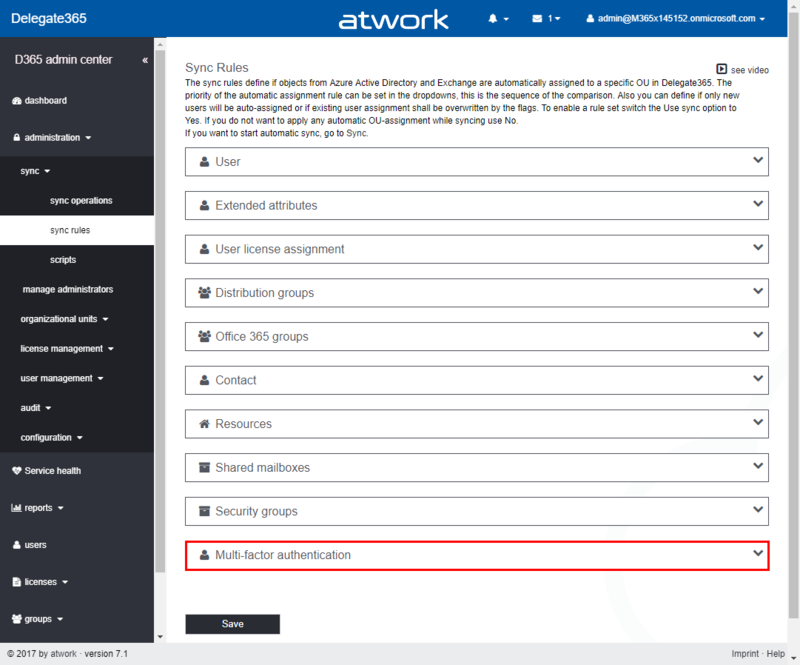 In the MFA box, admins can define rules in a similar way as in the rules above: By adding a condition if a user is member of a specific security group (or email enabled security group), the MFA status can be set for all users, sign-in allowed users or sign-in blocked users. The MFA status can be Deactivated, Enabled or Enforced. Click Save at the page bottom to save all rules on that page. Users who are members of the specified security group(s) who not already have the defined MFA status set, will get the new MFA status set. This operation is not directly attached to the SyncOp, but runs all 12 hours and reports to the common audit log. So, we can categorize this feature as an own task in a technical perspective for not interfering with a running SyncOp. This allows admins to easily define custom rules for enforcing the organization’s security policies for their users. Smaller fixes: We continuously are checking the solution and we are fixing minor issues constantly. Version 7.1 has some minor issues as text labels and validations fixed. We hope you like the new features and the improvements in Delegate 365 version 7.1! All Delegate365 productive tenants will be updated before Christmas automatically to benefit from the improvements. There are no actions necessary on the customer side. New test tenants will automatically get the new Delegate365 version.